iOS 5 has been available for some time now. Though there was great anticipation surrounding its release, in the end for me as an established iPad user iOS 5 primarily brings important but basically evolutionary changes in how I use the device. For new users, it’s safe to say that iOS 5 is revolutionary, and finally delivers on the promise, pretty much without exception, of the iPad as a standalone computer. The required workarounds are getting fewer and further between. So if you’re new to the iPad, or contemplating making the leap, there’s no good reason I can think of to wait any longer. You truly can use the iPad Alone, and without much if any compromise. Here at long last, after being teased in early betas of much older versions of iOS (wow was that 3.x where these images first surfaced?) we finally get a space bar that extends further right to the exact spot my thumb lands. Hallelujah!! My typing errors have decreased by an order of magnitude. Yes, seriously. The space bar has also disappeared from Safari when entering URLs though for the life of me I can’t recall if it was gone prior to iOS 5, and yes I am too lazy to check. This is a nice one, though to be honest it’s an incomplete function as you cannot nest a new folder within an existing one. Still need to fire up Mail on the Mac for that. Still, better than nothing and a feature I’ve now used more than once. This is a pretty neat feature though as a “file system” it still suffers from some pretty big drawbacks which I get into in my Dislikes below. I can’t help but think Apple will ultimately figure out this out. Still, it’s sort of disconcerting that the limitations still exist. This one is really cool. It doesn’t seem to happen automagically as I believe it should whenever connected to a charging source, but it does seem to work when I select Sync Now in the iPad’s settings. Note I have the same experience with my iPhone. Another cool one, though it’s not clear to me exactly what does and doesn’t get backed up. Specifically…user supplied content. Are 20GB worth of music or movies getting backed up if I supply it (as opposed to having been purchased from iTunes?). It says Documents but i can’t find a clear answer as to what that does or doesn’t include. And like Wifi Syncing, I seem to sometimes have to force this rather than have it happen automatically. As per my note about the iWork document syncing above, there remains a frustrating issue here: you still can’t mix file types (by say subject matter) and you can’t manage the storage outside of a given app. So first, for example, if you have a Numbers of Excel spreadsheet dealing with your household budget, and some PDFs of scanned receipts and leases, you can’t store them in a single place. Second, if you want to delete a Numbers file, you can only do that within Numbers or the iCloud settings area which has limited functionality. I was really hoping that I could give up my Dropbox/dropDAV/Documents-on-Mac-syncing-to-Dropbox “file system” but alas this is not yet to be. My second biggest gripe is the way safari now lags – pretty obviously – when typing in URLs. And yes it’s the same on both my iPad and iPhone, and no it didn’t do this prior to iOS 5. One step back. Sigh. The folder control functionality in Mail is very limited. Why? Why can’t I search the BODY of an email? Why can’t I create a new folder nested in an existing folder? Grrr. Edit: Turns out that folder control is somewhat provider specific. With my gmail account I *can* create a new folder nested in an existing one. But not for my primary imap account. Hmm. Who knew I had 26000 songs?? Technically not an iOS 5 issue but a man has to find a place to gripe, right? More ram please for web page caching! Again, this is not strictly and iOS issue, really more of a hardware thing. Switching tabs in Safari is better than ever, but still would be a whole lot better if the devices had more ram. Or simply even better memory management/prioritization. 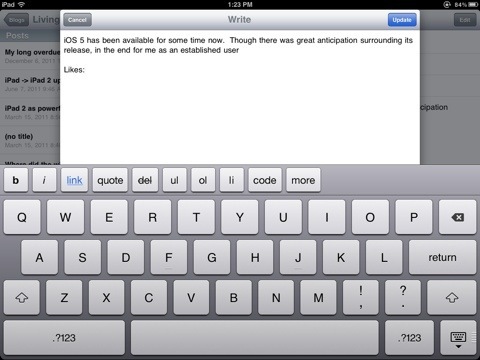 This entry was posted in Features, iOS, Musings, OS operating system and tagged iOS iPad as sole only computer. Bookmark the permalink. About what gets backed up / synced with iCloud — have you tried going to Settings > iCloud > Storage&Backup > Manage Storage? It shows you exactly what is being backed up / synced, and you can manage them app by app. Thanks a bunch. I had seen that, I guess I just hadn’t made the connection overall. It still seems like you have to piece things together though. Under Backup it says “camera roll, accounts, documents, and settings” but that’s not 100% right though if you also count apps, which are backed up to the cloud (even if not as part of the formal ‘Backup’) nor film and music purchased from Apple which is treated the same way. Also, what is an account? Mail settings I suppose? I don’t know what bothers me…it just feels incomplete somehow. When you sync to your Mac, *everything* is in both places – Mac and device. Logically, it “feels” like the iCloud backup should do the same. It doesn’t seem to though. I do agree that iCloud and iDevice’s “account” system is confusing — I think I’ve got the hang of it myself, though it took me a lot of time to figure it out, but I doubt I could explain it fully to anyone else! As far as backup is concerned, though, it does backup all data and settings to iCloud, the same as it does when you sync with iTunes on your computer. The having to piece everything together feeling comes in because it doesn’t backup media. I had to restore from iClouds backup once, and it was fairly painless — once the restore process completed after a few hours (I had a lot of apps installed, and they alll had to redownload), I had all my apps with their data and running perfectly. But I had no music or videos, no books in my iBooks, and only the pictures that were in my camera roll. To get the missing media back, I had to wait until I got home and could sync with my computer. If I had iTunes match, I could have redownloaded my music, I suppose, but for me it’s not worth it, mainly because most of my music is encoded at a higher bitrate than what you get from match. Thanks much for the comment. On the whole it seems that the inability to sync/store media in cloud backups is something that does prevent one from (safely) using an iPad as one’s sole computer. Although actually that’s backwards b/c if you used an iPad with no Mac, then pretty much by definition all your media would’ve been obtained via iTunes and iBooks (or other apps like Amazon with their own custom data lockers) and so it could easily be re-downloaded if necessary. I’ve just signed up to follow your blog as I’m doing the same thing: using the ipad2 as my only computer. I have had it since June and in November I sold my beloved Macbook Pro (13′ 2.4 unibody model) and have since had just the ipad. We are travelling on the road in India and mostly I have been able to manage although there are things I miss. My boyfriend has an 11inch Macbook Air which I can use if I need to but I’ve not linked up the ipad to it yet. My blog (which has not yet really got around to addressing the ipad issues yet but I plan to soon, especially after reading your blog) is minisuitcase.co.uk. Have you found an app that works for watching sites like sidereel, watchseries and megaskipper/megavideo yet? I can’t get any of the ones I’ve tried to work…? For my data storage I’m using Dropbox for documents and Picasa web albums for photos (uploaded with the camera connection kit) No videos to store on the road and icloud (the free one) activated for contacts and calendar etc. Are you still using the WordPress app for your blog? I’ve tried it and gone back to Blogsy. Although that is by no means perfect it works well with Picasa. Thanks for posting and subscribing Jen. And congrats and best wishes on using the iPad on your journeys – very exciting! I’m sort of jealous as it’s been a while since I put my efforts to such a test. And when I did the state of iOS and supporting apps was much more…primitive. Lots of kludgy work arounds as there was no printing, rational control of files. etc. Off to check out your blog. Good luck in your travels!